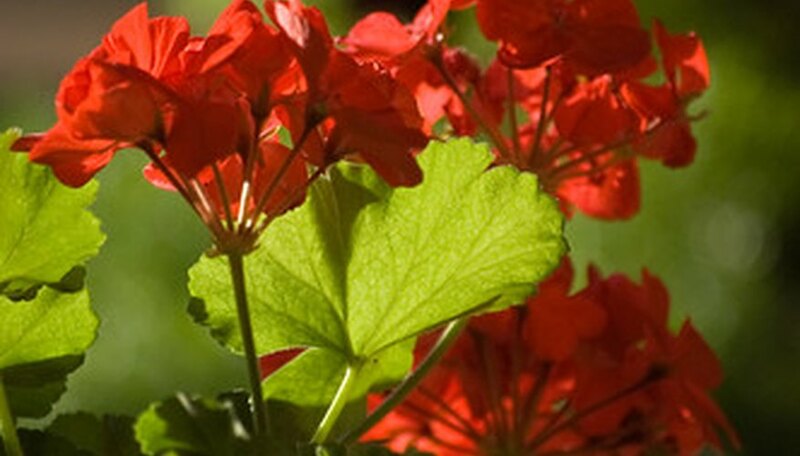 According to the University of Rhode Island, geraniums are a great flower for garden color. Geraniums begin to bloom in late spring and continue to provide colorful blossoms until the first frost. The production of a geranium plant can be increased by amending the soil with an application of magnesium sulfate, such as the kind found in Epsom salt. Epsom salt is one of the most convenient sources of magnesium sulfate commercially available. For people such as N. Ray Maxie at texasescapes.com, Epsom salt is thought of as a childhood cure-all that grandmothers would use for everything from bee stings to stomach aches as well as a sprinkling on the garden. The compound is named for Epsom, England. During the Elizabethan era, Englishmen traveled to Epsom to drink the magnesium-rich waters as a purgative and soak in them to sooth aching muscles. It isn’t clear when Epsom salts were first used to boost production of plants. In plants, magnesium is an essential component in chlorophyll molecules. Adding Epsom salt to your geraniums helps to boost production of chlorophyll, which increases photosynthesis and helps contribute to the increased vigor of geraniums. Epsom salts also contain sulfur, which help plants to grow tall and strong. According to Epsom Salt Industry Council, some gardeners give Epsom salt credit for everything from boosting seed germination and making plants bushier to speeding nutrient uptake. Geraniums are a popular choice for hanging baskets, potted plants and window boxes, according to Auburn University. Because potted geraniums are more dependent on added nutrients and fertilizers than a plant grown in a bed, they receive greater benefits from additives such as the kinds found in Epsom salts. Many all-purpose plant foods that are fed to house plants and other potted plants are deficient in secondary nutrients like magnesium and sulfur. Adding Epsom salts to these plants can give them the added nutrients that they need. Although geraniums can’t speak, they can still tell you when they are deficient in magnesium and sulfur. Geraniums that are deficient in magnesium will show marked yellowing of their leaves. The first leaves affected will be the oldest leaves, and then the progressively younger leaves will start to yellow as well. A geranium may also indicate a Sulfur deficiency through yellow leaves. Leaves that yellow due to low sulfur content will also have veins that are yellow as well. Before applying Epsom salts to flower beds, you should first have the soil tested to determine if it is deficient in magnesium and sulfur. Plants such as geraniums that receive too much magnesium may suffer from blossom rot, or may not produce blossoms at all. If your soil is deficient in magnesium, apply Epsom salts at a rate of 1 cup per 100 square feet of soil. Container plants will need a regular schedule of fertilizer, because they quickly deplete the fertilizer in their soil. To feed houseplants and container plants with Epsom salts, mix 1 tsp. per 1 gallon water and water with the solution every 2 to 4 weeks. "Get the Epsom Salt. This Kids Got Dew Poisoning"